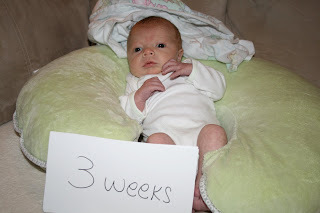 I know I'm probably going to say this every week, but I can not believe we are already 3 weeks in to parenthood. We took Keaton back to the doctor for another weight check on Saturday and I'm happy to say he gained 7 oz. and was up to 6 lbs 11 oz. Since he has now surpassed his birth weight we are all done with weight checks and don't have to go back until March for his 2-month check-up. We also had the lab repeat his newborn screening. I'm not exactly sure when we'll have the results back but we did ask the nurse what test was coming back "not right" and she said she thinks it was something to do with an enzyme definciency (though she wasn't absolutely certain). She did say again not to worry that sometimes this happens and that when they repeat the test the results come back normal. So, for now, we're not worrying. Since he finally put on some weight Keaton has really started to fill out in this past week. He doesn't really have baby chub yet but his belly is not as skinny as it used to be. As you can tell from the photo above, he has also become much more alert in the past week. He stays up now after his feedings for a good half hour 40 min. - sometimes longer. He is still pretty content during the day and only really fusses when he has gas or needs to poop. Our nights have also been going better. We've kept Keaton on a strict 3 hour feeding schedule during the day in hopes that if he gets more calories during this time that he will sleep better at night. It is working but I think his better nights have more to do with the fact that I have taken to sleeping with him on our fainting lounge for a portion of the night. I know it might be a bad habit to start, but for now it is getting us sleep and I've decided I'll deal with the downfall later. It just dawned on me one night that he only crys after his nightime feedings and, coincidently, that is the only time he is being layed flat after eating. During the day he usually goes in his swing and is sitting more straight up. So one night I took him out of his bassinet, sat with him on the fainting lounge and patted him back to sleep. As we sat there I could hear the gas in his tummy - so I'm pretty sure that is what is making him crabby after eating at night. We are still getting up for 2 feedings during the night, usually around midnight and 5 am (though those times aren't set in stone :) ). After our first feeding Keat is usually up for a good hour and is typically fussy but after the second feeding he zonks out and sleeps until about 9 am. We've also been using his co-sleeper more than his bassinet lately. He seems to sleep better if we are close enough to touch him if he squirms. In other news - that picture that I posted on Friday.....that was ME!! I was getting bummed because noone commented and said he looked like the old baby picture so I was thinking, crap, maybe I was wrong. But then, THEN, I got an email from Ember tonight and she said she thought the old baby picture was Collin because it looked like Keaton and I about died. YES!! She sees it!! I still think he looks mostly like Collin, but when my Dad pulled that old picture of me out of his wallet Friday night I was shocked to realize that, oh my God, maybe this is my kid! Once Keaton's birth announcements are out I'll repost that picture so, hopefully, you can see it to. Did you know that babies tend to look like dad after being born as a survival instinct from LONG ago. It's an animal thing that helped Dads to feel closer to their young and want to protect them. So the similarities SHOULD be closer to him than you right now. I couldn't tell who was in the picture. I should have guessed you, since I knew your parents were up when the pic was loaded, but I wasn't thinking at the time. Thanks for the call the other day...I went to see the family that night and am feeling a bit better. I even went to work last night and didn't lash out, so I'm guessing that's a good sign! Anyway, keep the pics coming! He's awfully cute! I didn't respond to the comparison cause I didn't know who it was, but I think he looks just like you, so I should've guessed it in the picture. It's so fun to look at old baby pictures and see the similarities! Thanks for sharing! That's my comment above...as you can tell, I'm not too savvy with these blog posts! Just wanted to lend some thoughts as I have been nursing Morgan for 4 months now and she still doesn't sleep 100% through the night. In the beginning, I noticed she would cluster feed from 4-9pm (sometimes would eat every 1.5-2 hours. Also, she was getting up usually every 3 hours at nighttime as well. So don't be worried if that happens as breastfed babies usually do that. He is looking more like a person and not a little wormey worm! Also...this sleeping thing...does it go in the bed with you? Oh good - I'm so happy to hear you guys saw the similarities! I can't wait to show you his birth announcement photo next to my birth photo, I think they look so much alike! Sarah - thanks for the info. It is good to know that if we don't get down to sleeping entirely through the night that we aren't abnormal. I'm actually reading a book right now that says if the baby sleeps between 12 am and 5 am that is considered "sleeping through the night". Crazy huh? Before we left the hospital they told us we could expect to see a growth spurt around days 7, 14, & 21 and that he'd probably cluster feed around those days. We've definitely noticied that he has done this. Kristin - yes, it does go in the bed with us. I'd love to co-sleep but I'm terrified of doing it because I'm not a real light, light sleeper. Using this has been a good compromise. He is still in bed with us but I feel safer knowing that I'm not going to roll on top of him. The sides are metal so if you do get close to it you can feel it. We really like it! I think JJ was about 6 months old before he stopped eating at least once during the night. BUT - we had to move him to his own room before he was 2 months old and he slept a lot better - Daddy's snoring kept waking him up! I used to be a deep, heavy sleeper - but having Jacob changed that. I hear a peep over that monitor and I'm AWAKE! I think it is so sweet that your dad still carries your baby picture in his wallet! I too, thought the picture was Collin. Keaton is growing so much! He's losing that newborn look (I thought Jacob looked like a plucked chicken all curled up and red) and just looking like a cute little baby! I miss that part!